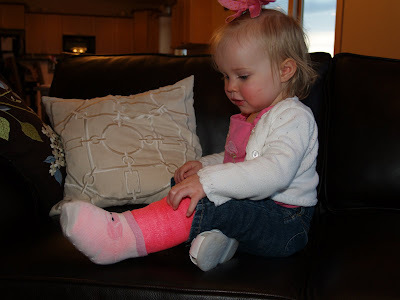 I am sure you will be seeing many pink cast photos over the next month from the true Lil’ Miss Pinke! 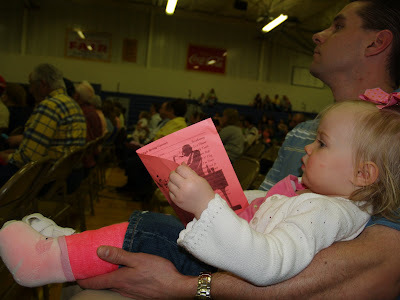 Tonight Miss Pinke sitting in Daddy’s lap at Hunter’s spring music concert at school. Socks on to keep her toes warm. 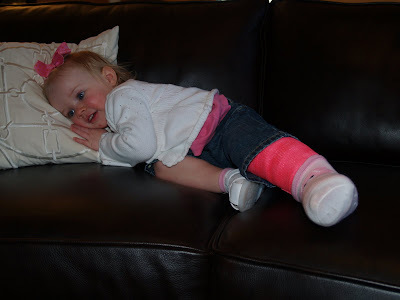 The cast goes a few inches above her left knee and almost to the end of her foot. Her sweet little pink painted toe nails peek out at the end of it. Nathan said “Smile for mommy” and this is what I got. Cheesy smile. Yesterday in my panic of not being home for the casting of E’s leg, I called my mom. Nathan had reassured me “Katie, it’s not her heart or cancer. It is her leg. And she is very happy and just fine.” He encouraged me to stay and do my work. A supportive husband is a gift. And so is a loving mother. After my phone call to my mom, she called me back telling me she was driving to our house. Between Nathan and his parents they could have easily handled everything like they always do when I am gone for work. But my mom is like an additional security blanket for me! I stayed for my needed business commitments. All was well. Plus my dad came to Fargo and was a part a business dinner we both had last night. After dinner, I did some late night “therapy” shopping for dear daughter at the only place open…Wal-Mart. The girl needed some new outfits that will fit over her cast and match it too! I’m not a Wal-Mart snob but haven’t been wardrobe shopping there before for my kids. I will do it again. Cute and cheap. Not quality but it definitely more than I expected. I made one stop at the mall before leaving this afternoon to supplement my Wal-Mart purchases. The girl is now set for her cast wearing wardrobe. Tonight when I got home there was dinner in the oven. The laundry was done. Everything was ready for us to eat and get to Hunter’s concert together as a family. Although Hunter rolled his eyes a few times as he emptied the car for me. Too many shopping bags he thought. I reminded him of how well cared for he was ten years ago when he broke his arm. He smiled. Tomorrow Hunter has his elementary track meet which gets my track and field juices flowing just typing about it! Pictures to follow. How long does she have to wear that clunky thing?? Can she walk in it??? I love her huge smile despite the clunker! She is too cute!! She is too adorable!! 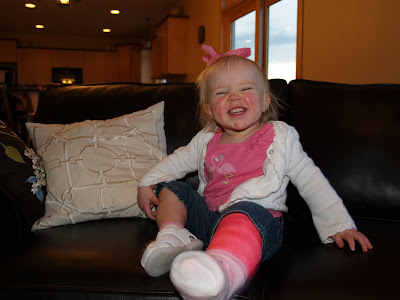 She is smily and just loving life even though she has a pink cast going with her where ever she goes. She is a trooper! !